Looking for a Furry, Lovable and Loyal Companion? Look no Further. The Labradoodle or Goldendoodle may be the Perfect Pet for You! Labradoodles and Goldendoodles are often mistaken for being the same breed of dog. It may be due to the fact that they both end with ‘Doodle’, a representation of their Poodle parent or the fact that more times than not they could pass as twins. While these dogs may share similar physical qualities, there are definite differences between these two dog breeds. The Labradoodle, a cross between a Poodle and a Labrador share’s a number of similar and a number of vastly different qualities to the Goldendoodle, a cross between a Poodle and a Golden Retriever. Labradors, Golden Retrievers and Poodles are among the most sought after breeds in the world so it is no surprise that these cross breed dogs who have less health concerns and hypoallergenic fur have become increasingly popular. While both the Labradoodle and Goldendoodle are well known for their kind nature; their size and coat texture/color varies from one breed to the other. In this article we’ll take a look at the main similarities and differences between a Labradoodle and a Goldendoodle to determine which breed will better suit your lifestyle. 9 Which Breed is Right for Me? Once one comes to the realization that the only difference between the Labradoodle and the Goldendoodle is the breed crossed with the Poodle parent, the differences become apparent. For example, Golden Retrievers are known for their welcoming personality and so are their cross breed relatives, the Goldendoodles. The breed name Goldendoodle may be mistaken as being a representation of the color of the dog. While Goldendoodles are often gold in color, their name is simply a mix of the name Golden Retriever and Poodle in the same way Labradoodle is a mix of Labrador and Poodle. Labrador and Golden Retriever thoroughbred dogs are in fact similar in size. An adult Labrador can weigh in anywhere from 55 to 80 pounds while similarly an adult Golden Retriever weighs somewhere between 55 to 75 pounds. This makes the higher average of a Golden Retriever slightly less heavy than a Labrador. If you are purchasing a standard Labradoodle or Goldendoodle, this means that one of the parents was bred with a standard Poodle. Standard Poodles weigh in anywhere from 40 to 70 pounds. From this we can see that the weight of each dog when they are fully grown ultimately depends on how heavy their parents are. Prior to purchasing a Labradoodle or Goldendoodle puppy from a breeder, it is a good idea to inquire or view the parents. This will give you some idea about how large your dog will be once they reach adulthood. The size of a Labradoodle or Goldendoodle just like any other breed depends on genetics, gender, nutrition and birth order. While the majority of times a Labradoodle will slightly outgrow a Goldendoodle, this is not always the case. Even if the same Poodle parented both the Labradoodle and the Goldendoodle, there is no guarantee that the Labradoodle will be larger in size. Both the Labradoodle and Goldendoodle puppies and adults are attractive dogs. The range of colors they come in is broad, from black to cream to chocolate or tri-colored. While the coat type of a Labradoodle tends to be short either wavy or wiry, the coat of their cousin, the Goldendoodle often needs more grooming as their coat can be long and wavy or curly. When comparing first generation Labradoodle’s and Goldendoodle’s the differences in their coat can become apparent. A Labradoodle often has wiry short fur opposed to the Goldendoodle who sports wavy long fur. Another apparent difference is the coat colors of these first generation Doodles. If a cream colored Poodle has been crossed with a Golden Retriever, the majority of puppies will be born with golden coats. While Goldendoodle’s can come in a variety of colors, they are commonly shades of caramel. This is somewhat different to a Labradoodle who may be born into a litter where 5 or so different colors are apparent. These color differences between Labradoodles and Goldendoodles can be viewed in the images above. The left image shows the Goldendoodle puppy coats while the right image shows the differing Labradoodle puppy coats. When talking about Labradoodle and Goldendoodle litters, within a standard Labradoodle litter there will often be between 6 to 10 puppies while a Goldendoodle mother can deliver between 6 to 12 puppies. These litter sizes are only averages and some mother may only have 2 or 3 puppies. Labradoodle Curly/Silky Chalk, Cream, Gold, Caramel, Red, Black, Chocolate, Silver, Blue, Lavender, Parti, Phantom, Abstract, Sable and Brindle. Goldendoodle Wavy/Soft More times than not, Goldendoodles are one solid color; Cream, Apricot, Red, Chocolate or Black. Both the Labradoodle and Goldendoodle breeds are well known for their affectionate, friendly, loyal and active personalities. While the temperament of each dog ultimately depends on their life experiences and the way they are raised, in general both these breeds make great family dogs to have around young children. 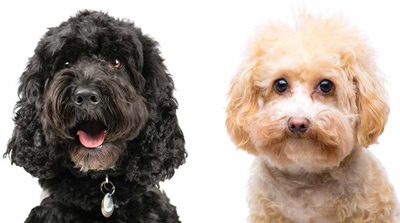 The difference in behavior between these breeds is the higher activity level of the Labradoodle. Generally Labradors are non-stop dogs and this shines through the mix breed Labradoodles. This hyperactive personality can be put to great use if you intend on taking your Labradoodle hunting or you own a farm. Furthermore, these dogs make great assistance dogs for those who are visually impaired and have allergies to normal dog coats. If you are looking for a lap dog, keep looking as neither the Labradoodle or Goldendoodle is right for you. Even though the Goldendoodle may be a little less active than the Labradoodle, they are both high energy dogs that need regular exercise. When talking about the personality of a Goldendoodle, they can be described as outgoing. They always tend to be happy dogs that make great therapy dogs for those going through a tough time. While the Goldendoodle certainly has a lot of energy, they are generally less hyperactive than the Labradoodle breed. 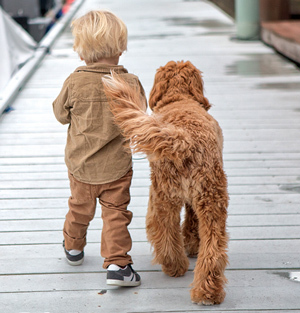 In terms of being outgoing, the Goldendoodle comes in first. If a Goldendoodle and Labradoodle were exposed to a stranger, the Goldendoodle would have no hesitation to say hello while the Labradoodle may shy away. Labradoodles often take their time to warm up to new environments and people although once they do, they won’t hesitate to invade your personal space with licks and hugs. Both the Labradoodle and Goldendoodle breed do not display aggressive behavior making them suitable for families. While sometimes these dogs are used to guard a property they lack the aggressive nature to be a guard dog. They may bark if they see an intruder although their bark more times than not will be followed with excitement and liking. These dogs should be interacted with and well socialized if they are going to be exposed to young children. Labradoodle Loyal to their family although may shy away from strangers. Goldendoodle Friendly to all whom they meet, enthusiastic and overly happy. While no breed is 100% allergy free, both the Labradoodle and Goldendoodle breeds come as close as you can get with their hypoallergenic coats. It is the Poodle within these mix breed dogs that gives them their low shedding and allergy friendly coats. If you suffer from allergies choosing a 2nd generation Labradoodle or Goldendoodle will further ensure the dog will have hypoallergenic qualities. The second generation doodle refers to those puppies being the result of a doodle x doodle. While some of the first generation doodles which are a direct cross between two thoroughbred dogs can have allergy free coats, it is really pot luck. If the parent takes after the Retriever more than the Poodle, you may find their coat is not as allergy free as you were made to believe. The Poodle is an intelligent breed making both the Labradoodle’s and the Goldendoodle’s smart and easily trained dogs. These breeds are fast learners and have a constant will to please their owners. Starting training early can help the doodle puppy to learn right from wrong. As the saying goes, it’s hard to teach an old dog new tricks. A Labradoodle or Goldendoodle will only seek out mischief if they become bored. Being intelligent breeds, they need stimulation to keep them occupied. Make sure you are prepared for a high-energy dog if you take a Labradoodle or Goldendoodle home. These dogs will live into their early teens so it is a lot of commitment and hard work, although you will be rewarded with a mans best friend! Mix breed dogs generally have less health issues than those thorough bred dogs. In saying this, Labradoodles are more prone to hip dysplasia and retinal atrophy inherited from their Labrador parent, while the Goldendoodles are prone to cancer and heart disease inherited from their Golden Retriever parent. The Poodle parent of each breed is prone to hip dysplasia, progressive retinal atrophy and other eye problems making it a possibility for either a Labradoodle or Goldendoodle to fall ill with one of these diseases. If the parent of a Labradoodle or Goldendoodle has fallen ill with a genetic condition, the puppy has a higher chance of falling ill later on once they reach adulthood. Reputable breeders often conduct genetic testing to ensure that the puppies they are selling have a minimal chance of inheriting any known diseases. Some breeders even offer a money back guarantee if your puppy falls ill within the first 12 months of their life. While this will not replace the dog you have bonded with, it does give owners some peace of mind that they will be able to adopt a healthy puppy. A Labradoodle’s life expectancy is 12 to 14 years old while the life span of a Goldendoodle is 10 to 14 years. Prior to purchasing a doodle ensure you are in a financial position to adopt a dog. After reading about the differences between the Labradoodle and the Goldendoodle you may find yourself finally selecting which breed is right for you. If you intend on purchasing a puppy, ensure you do so from a reputable breeder. Whether you choose to purchase a Labradoodle or Goldendoodle as your forever friend, both breeds have more in common than not making them both a great decision. For those who are still weighing up which breed is right for them, if you have additional free time, room in your heart and room in your yard for two fur babies, why not purchase one of each! We’d love to hear which Doodle was the perfect fit for your family in the comments section below. Are You Thinking About Purchasing a Labradoodle? Take a Look at Our Labradoodle Complete Overview for any Further Questions You May Have. The difference between Mini Goldendoodle vs Mini Labradoodle is another good article to read if you are after the mini version of these dogs. 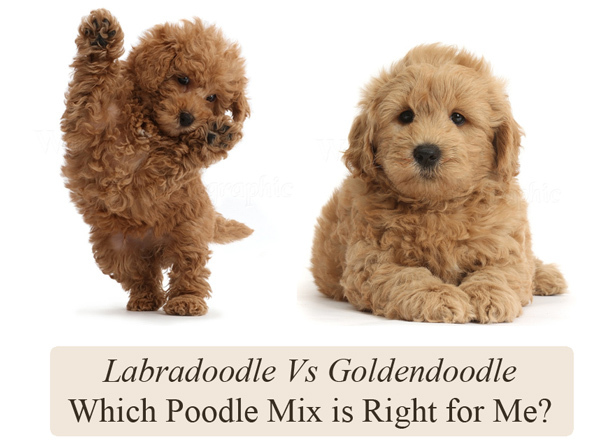 Mini Goldendoodle vs Mini Labradoodle – Which is Right For You?